On my last visit to Bryant Park I not only spent time photographing the wintering birds there but also carefully watching them, trying to figure out how such a small urban park with so little proper habitat could possibly be providing enough food for birds that aren’t used to a diet of bread crumbs and table scraps. And while I am still not sure how they do it, I did learn a bit about where the Lincoln’s Sparrow, Ovenbirds, Gray Catbirds, and Yellow-breasted Chats are getting their sustenance. Mostly, they seem to be willing to search every square millimeter for food of any kind. They turn over mulch, twigs, and leaves; they search cracks, crevices, and crannies; they even hop up staircases to see where the stairs lead. 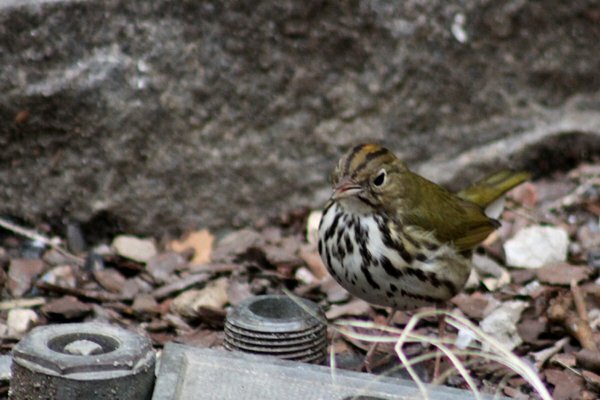 The birds that are wintering in Bryant Park can’t leave any portion of the park unexplored. They must find enough food or die. 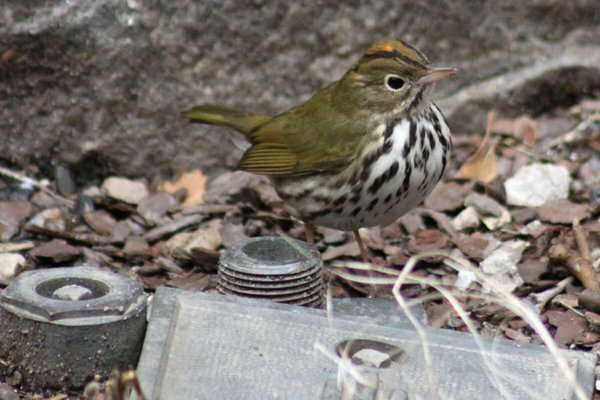 This Ovenbird is no exception. I’m just an ordinary Ovenbird minding my own business. Do I dare make this plunge? I must have courage! Next time I’m just ordering take out. Excellent series of the Ovenbird man. Hysterical. @James and Doug G: Thanks! Oh this is just too hilarious!! !